Rio Tinto is a British-Australian multinational metals and mining corporation with headquarters in London, in the United Kingdom, and a management office in Melbourne, Australia. Since 1873 when it was founded, the company has grown through a long series of mergers and acquisitions to place itself among the world leaders in the production of many commodities, including aluminium, iron ore, copper, uranium, coal, and diamonds. The company has operations on six continents but is mainly concentrated in Australia and Canada, and owns gross assets valued at $81 billion through a complex web of wholly and partly owned subsidiaries. Rio Tinto Group is a dual-listed company traded on both the London Stock Exchange where it is a component of the FTSE 100 Index and the Australian Securities Exchange where it is a component of the S&P/ASX 200 index. The Oyu Tolgoi copper and gold mine being developed in Mongolia, where pastoralist communities now find their traditional lifestyle threatened with extinction. One of the key concerns is that the mine will use enormous quantities of water in a desert region and the company has failed to demonstrate the availability of sufficient water needed for production, infrastructure and the social needs of the project. Beyond the damage inflicted by the roads, there are further impacts caused by the construction of mine-supporting infrastructure, such as water pipelines, river diversions, worker camps, airstrips and electricity transmission lines. In July 2013, a group of Mongolian herders submitted today an official complaint to the Project Complaints Mechanism of the European Bank for Reconstruction and Development that is part funding the development. The Bingham Canyon mine, the single largest open pit mining operation and the deepest excavation of its kind in the world. There is no other mining operation in the world this large that is so close to a population of 1.8 million – possibly making the direct adverse impacts on public health unique. Groups in Utah are protesting about air pollution from Rio Tinto’s Bingham Canyon operations, which contributes to hundreds of premature deaths each year in the Salt Lake City area. The company is accused of violation of Indigenous treaty rights at the Eagle Mine site in Michigan, USA. Persistent local citizen opposition against Rio Tinto’s Eagle Mine includes concerns that waste water-injection into aquifers will impact local water quality, potential for irreversible acid mine drainage, ecosystem degradation and the technical likelihood of mine collapse. 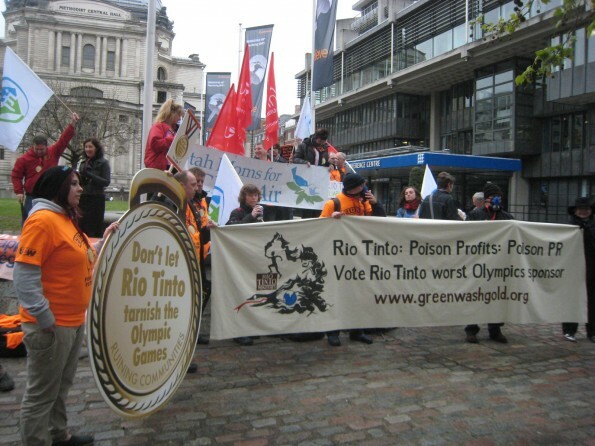 Read a more comprehensive list of many of the concerns surrounding Rio Tinto.